Ahh yes. The Ironman. The toughest one day event in world. It’s lure has grown to the point that has been inserted into everyday conversation. If someone endures in any facet of life, they are often referred to as an “Ironman”. Timex has made a fortune on their watch by the same name. It all started in a bar back in the late 70’s. An argument began over who the fittest athletes were. Naval Officer John Collins suggested settling the argument by combining the Wikiki Rough Water Swim with the Round the Island Bike Race. If they knocked 3 miles off of the ride it would put them at the start of the Honolulu Marathon. The Ironman was born. 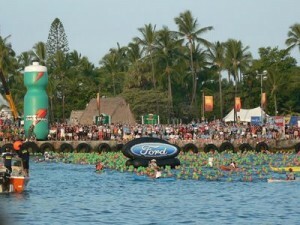 After a couple of years the race grew too big for its urban location, so the event was moved to the big island. The course is the stuff of legend. It’s a open water swim in the Pacific Ocean. The bike takes you north up the island across the lava fields and through some of the toughest winds anywhere, which have reached upwards of 60 mph and have blown people right off their bike. The run starts along the coast and then moves back out into the heat and isolation of the black lava fields. The suffering ends back where you started at Kailua Bay for the finish down Alii Drive. This race was one of the main reasons that I got into this sport. Back in 1986 I had completed a couple of kids triathlons and was mildly interested in the sport until I saw the Nice Triathlon on TV followed by the Ironman the very next day. Watching those epic battles got me hooked, and from that point on the Hawaiian Ironman became a major motivation in my athletic life like so many others. Getting into the race can be achieved in a few different ways. The vast majority of the 1800 athletes must qualify by a top placing in other races to get in. The organization leaves about 180 entries open to the “everyman” which are selected via a lottery system. Finally, a few entries are auctioned off via Ebay (with winning bids in the neighborhood of $50,000). I have been priviledged enough to qualify 5 times and compete in this race twice. In fact, I’ve been one of the lucky ones who has actually led this race. The first time I made my way to Kona I did it as a professional athlete in 1997. I wasn’t the healthiest of athletes that day (the Olympic Training Center doctors told me I was borderline anemic), but being a good swimmer certainly has it’s moments. I took the lead in the swim shortly after the cannon went off. Sometime during the return trip from the turnaround boats I swapped places with German Wolfgang Dittrich and sat comfortably in second. With approximately 30 yards to go in the swim ,2 athletes came around us to try and grab a little camera time. So I finished 4th out of the water and hopped on the bike in second place behind Wolfgang. Somewhere a ways down the road on the Queen K we were caught by the race favorites. I was dumped from the front end of the race shortly after the turn at Hawi as my cramping problems mounted. I ended the day not remembering the last 3 miles in a race that is regarded by the organizers as having one of the toughest conditions in Ironman history (This was the same year Chris Legh collapsed 50 feet from the finish and the famous crawl for 5th place between Sian Welch and Wendy Ingram). So what’s it like to lead the Ironman? Verrrrry cool. And rest assured I was definitely thinking this during the race as I had a camera in my face and watched the helicopters right over my head. I returned to the race in 2006. This time my motivation was to just enjoy the day. For whatever reason though, this race has got my number as I got a flat on the bike and suffered the last 10 miles of the run like I’ve never suffered before. One of these days I’m bound to have a good day there. So does it measure up to all the hype? You bet. If you are looking to test your absolute limits on the biggest stage the sport of triathlon has to offer, then find a way to get yourself in Kailua Bay on the Saturday of the full moon in October.